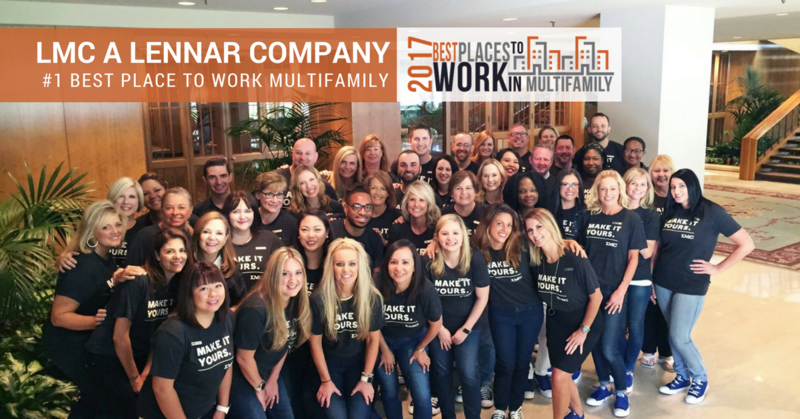 View the 2017 Best Places to Work Multifamily™. 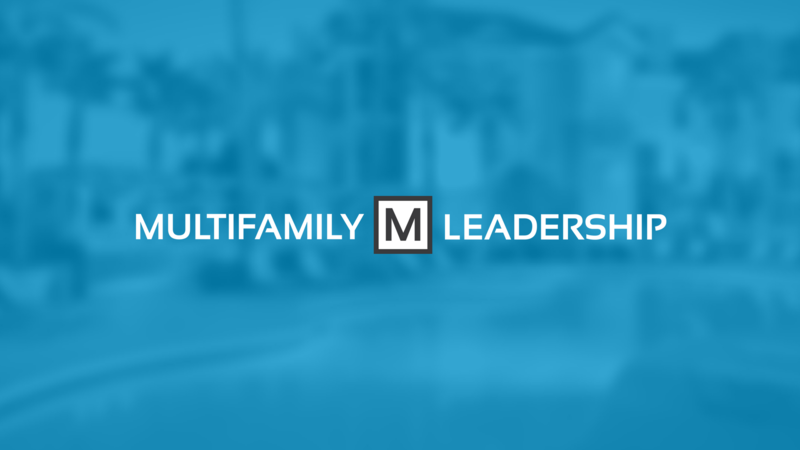 Program participants celebrated the rankings at the Annual Multifamily Leadership Summit. 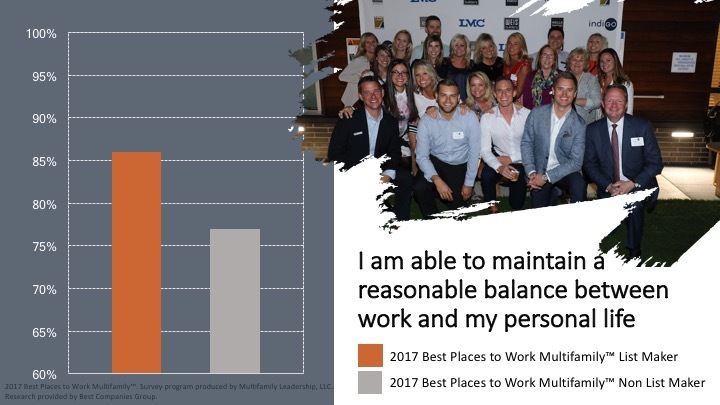 We provide forward thinking executives with a snapshot of what characterizes the best places to work in multifamily. 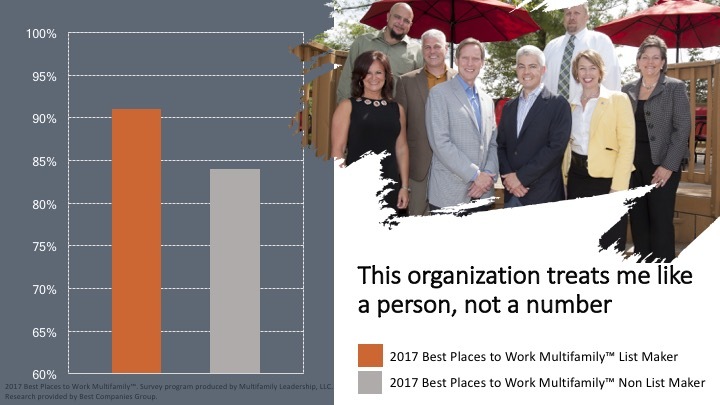 This report summarizes results of the 2017 Best Places to Work in Multifamily program. 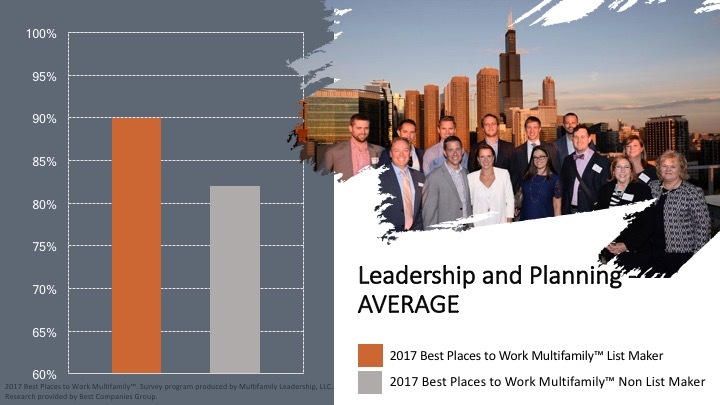 Our goal is to provide forward thinking executives with a snapshot of what characterizes the best places to work in multifamily. 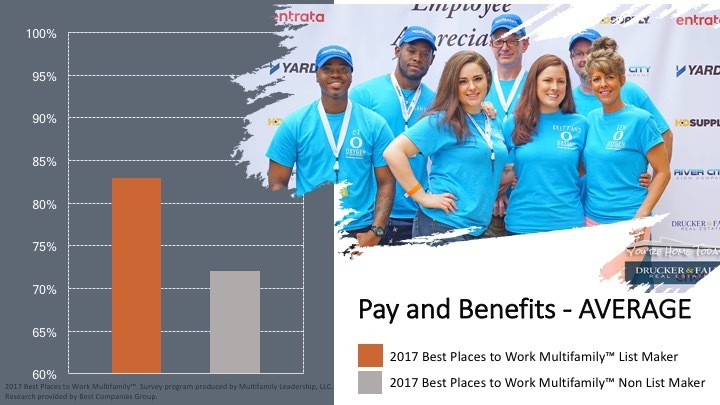 Each report contains examples of the benefits and perks offered by participating organizations, as well as employee engagement and satisfaction averages from our survey process. 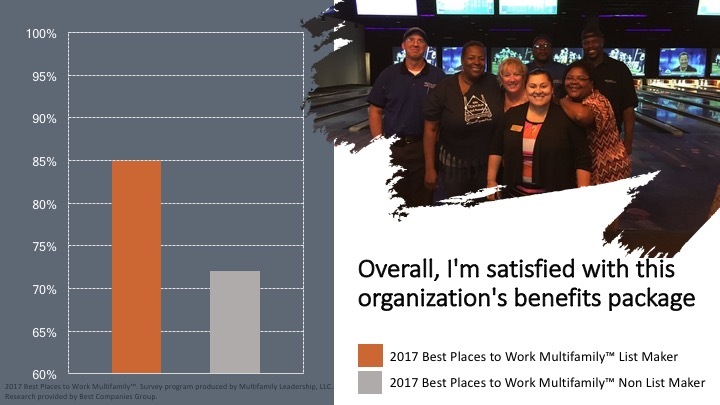 When an organization appears on the “Best Places to Work in Multifamily™” list, management, employees, and other stakeholders feel an overwhelming sense of pride within the organization. 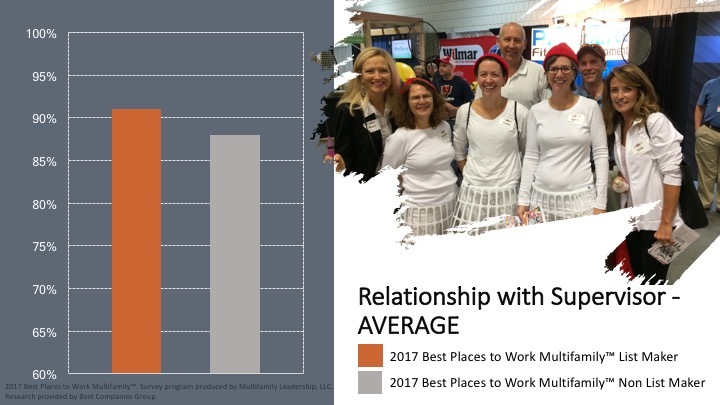 The “Best Places to Work in Multifamily™” award affirms an employees’ sense of belonging within the organization, therefore increasing employee engagement and retention. 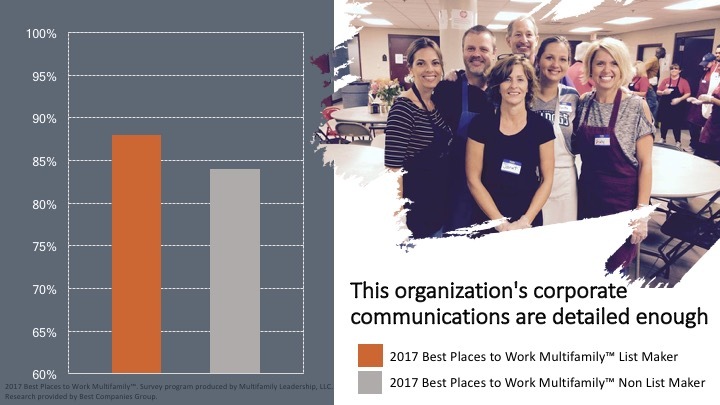 Organizations named to the “Best Places to Work in Multifamily™” list can see a tremendous impact on any marketing they conduct. They can use the distinction to enhance their employee recruiting efforts, increase effectiveness of the organization’s marketing to reach residents, and improve their reputation in the community, state, or industry. 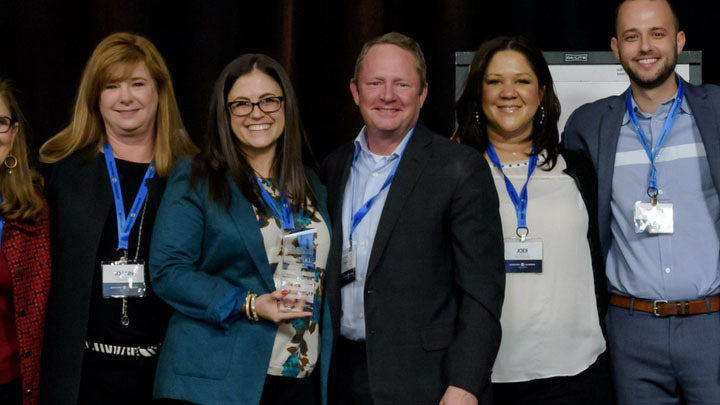 Whether or not you think your organization would receive a “Best Place to Work in Multifamily™” distinction, we encourage you to participate. Gathering feedback from your employees will provide you with a baseline so you can see where your organization can improve. The results of the survey process prove an invaluable tool for any participating organization, even if they do not make the list. After completion of the survey process, all participating organizations have the option to receive the Employee Feedback Report, which includes employee feedback for each survey question, employee comments, and aggregate organizational benchmarks. Benchmarking data allows organizations to compare their scores to the overall averages of both the list-making organizations as well as all program participants. To conduct this kind of in-depth research independently would normally cost between $5,000 and $10,000 in consulting fees. Amongst those that made the list, there is an average of 90% engagement for the aggregate response in the Leadership & Planning section. Amongst those that did not make the list, there is an average of 82% engagement for the aggregate response in the Leadership & Planning section. 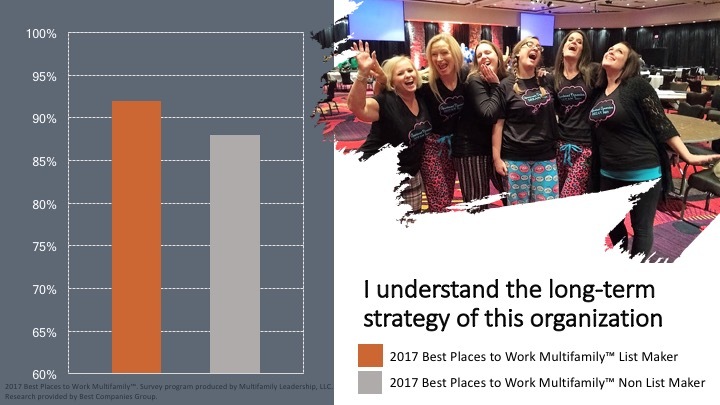 Amongst those that made the list of the Best Places to Work Multifamily™ 92% understand the long term vision of their organization. 88% of employees researched from companies not making the list understand the long-term strategy of their organization. 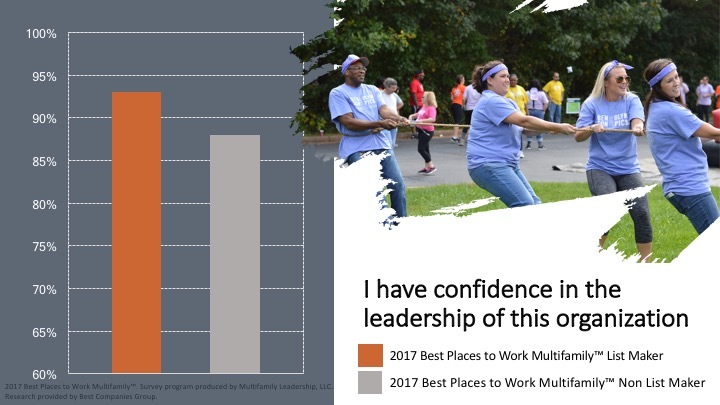 Amongst those that made the list of the Best Places to Work Multifamily™ 93% have confidence in the leadership of their organization. 88% of employees researched from companies not making the list have confidence in the leadership of their organization. 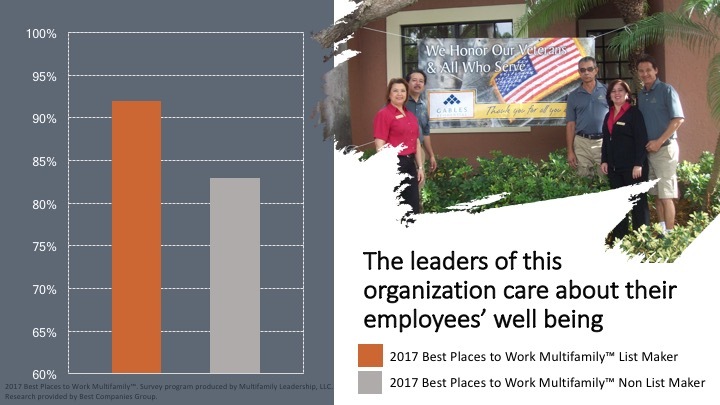 Amongst those that made the list of the Best Places to Work Multifamily™ 92% agree that the leaders of this organization care about their employees’ well being. 83% of employees researched from companies not making the list agree that the leaders of this organization care about their employees’ well being. 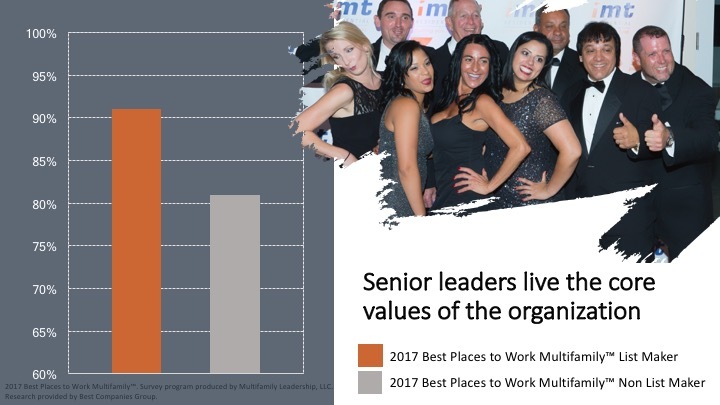 Amongst those that made the list of the Best Places to Work Multifamily™ 91% agree that the senior leaders live the core values of the organization. 81% of employees researched from companies not making the list agree that the senior leaders live the core values of the organization. 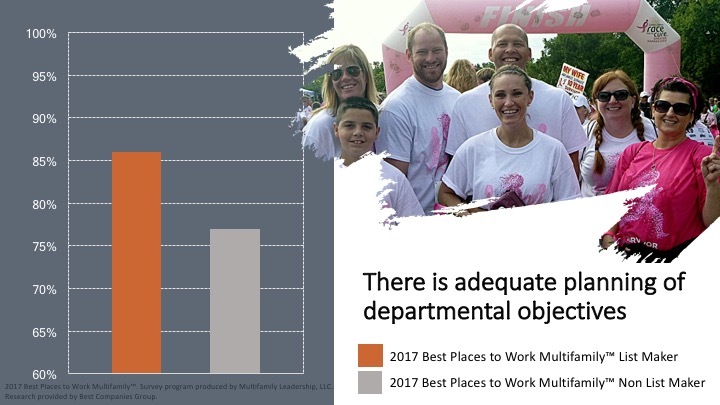 Amongst those that made the list of the Best Places to Work Multifamily™ 86% agree that there is adequate planning of departmental objectives. 77% of employees researched from companies not making the list agree that there is adequate planning of departmental objectives. 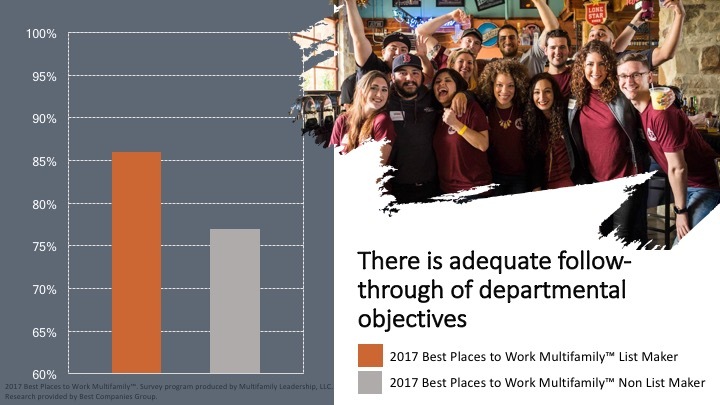 Amongst those that made the list of the Best Places to Work Multifamily™ 86% agree there is adequate follow-through of departmental objectives. 77% of employees researched from companies not making the list agree there is adequate follow-through of departmental objectives. 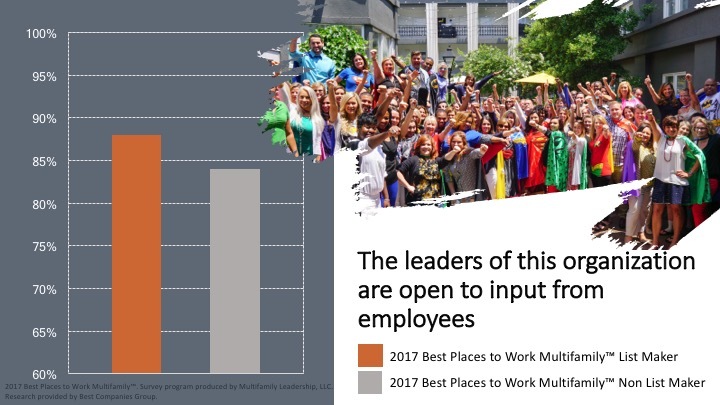 Amongst those that made the list of the Best Places to Work Multifamily™ 88% agree that the leaders of this organization are open to input from employees. 84% of employees researched from companies not making the list agree that the leaders of this organization are open to input from employees. Amongst those that made the list, there is an average of 88% engagement for the aggregate response in the Corporate Culture & Communications section. Amongst those that did not make the list, there is an average of 81% engagement for the aggregate response in the Corporate Culture & Communications section. 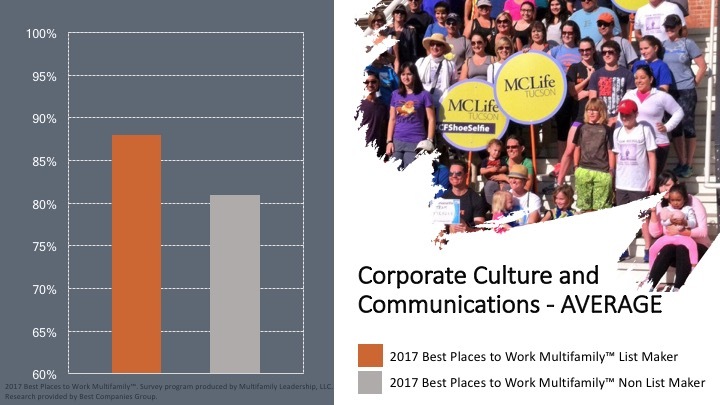 Amongst those that made the list of the Best Places to Work Multifamily™ 89% agree their organization’s corporate communications are frequent enough. 83% of employees researched from companies not making the list agree their organization’s corporate communications are frequent enough. 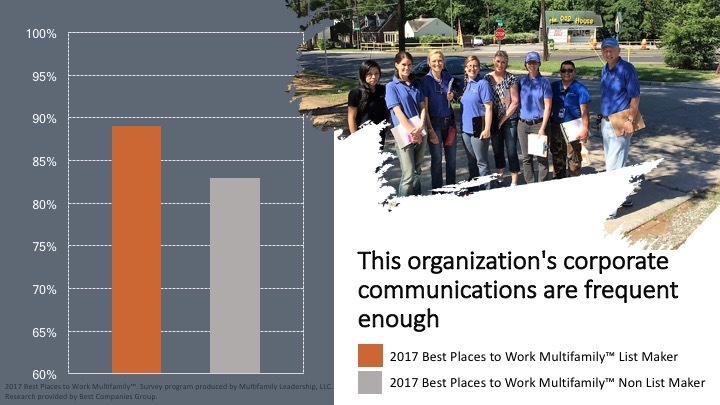 Amongst those that made the list of the Best Places to Work Multifamily™ 88% agree their organization’s corporate communications are detailed enough. 84% of employees researched from companies not making the list agree their organization’s corporate communications are detailed enough. 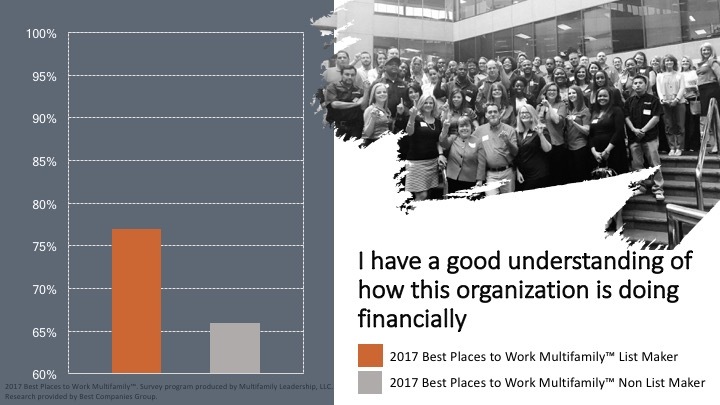 Amongst those that made the list of the Best Places to Work Multifamily™ 77% have a good understanding of how their organization is doing financially. 66% of employees researched from companies not making the list have a good understanding of how their organization is doing financially. 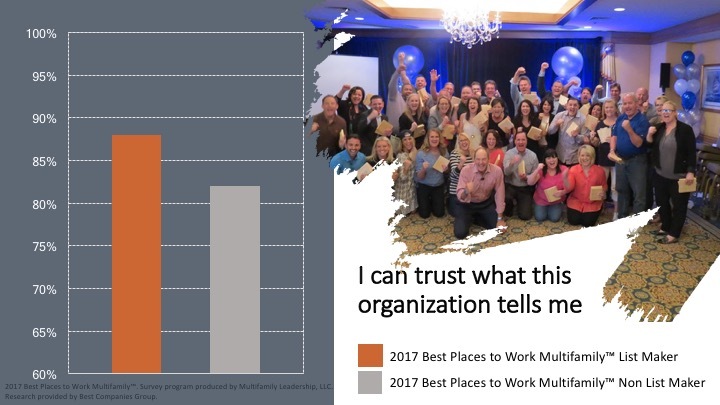 Amongst those that made the list of the Best Places to Work Multifamily™ 88% can trust what their organization tells them. 82% of employees researched from companies not making the list can trust what this organization tells them. 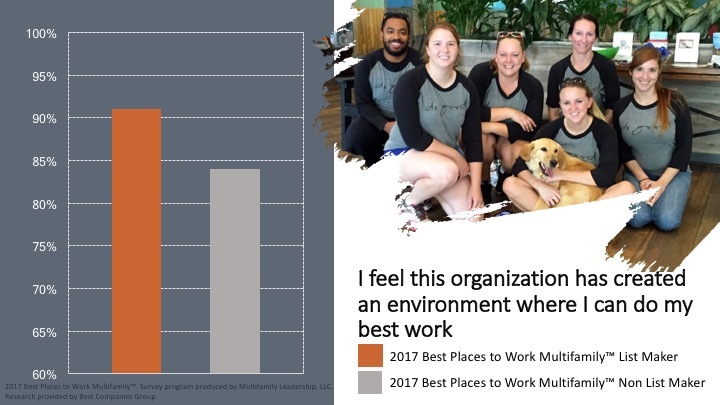 Amongst those that made the list of the Best Places to Work Multifamily™ 91% agree their organization treats them like a person, not a number. 84% of employees researched from companies not making the list agree their organization treats them like a person, not a number. 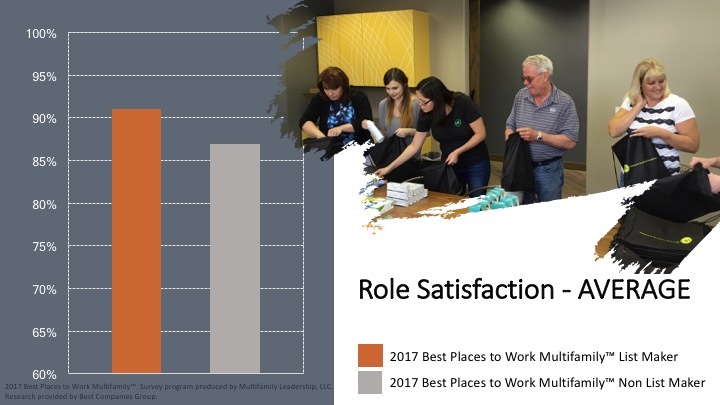 Amongst those that made the list of the Best Places to Work Multifamily™ 85% believe their organization gives them enough recognition for work that is well done. 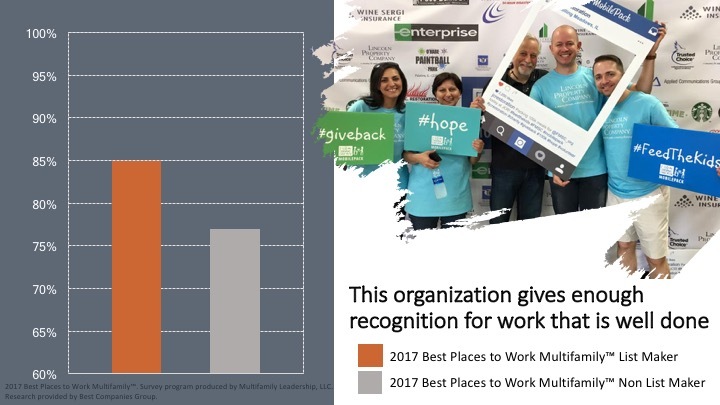 77% of employees researched from companies not making the list believe their organization gives them enough recognition for work that is well done. 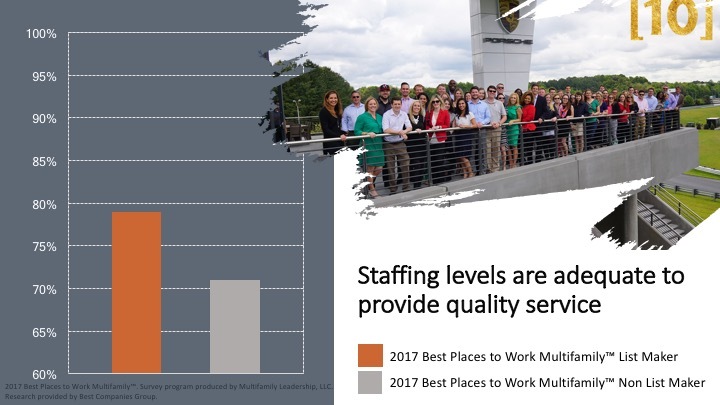 Amongst those that made the list of the Best Places to Work Multifamily™ 79% agree staffing levels are adequate to provide quality products/services. 71% of employees researched from companies not making the list agree staffing levels are adequate to provide quality products/services. 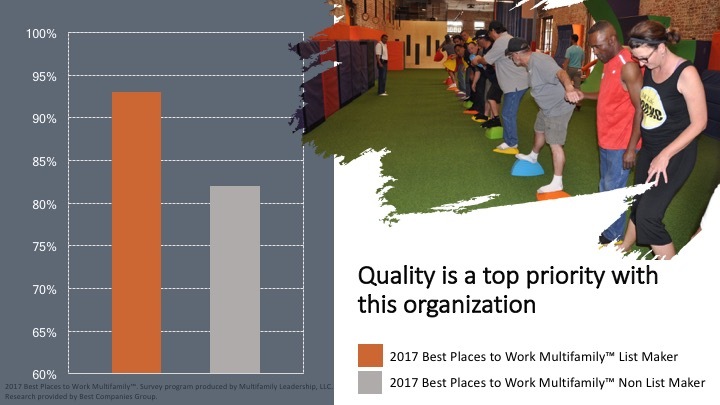 Amongst those that made the list of the Best Places to Work Multifamily™ 93% believe quality is a top priority with their organization. 82% of employees researched from companies not making the list believe quality is a top priority with their organization. 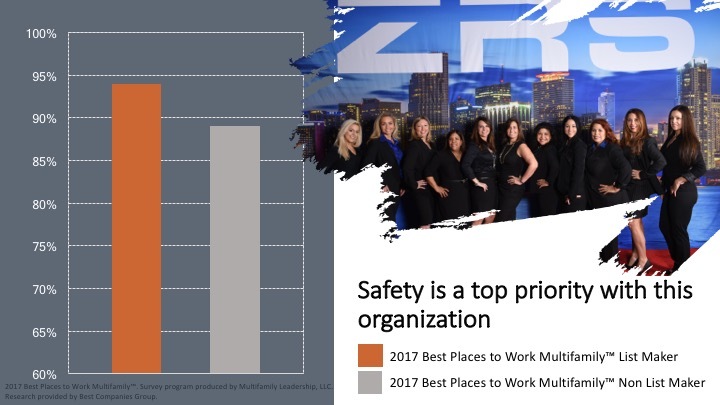 Amongst those that made the list of the Best Places to Work Multifamily™ 94% believe safety to be a top priority with their organization. 89% of employees researched from companies not making the list believe safety to be a top priority with their organization. 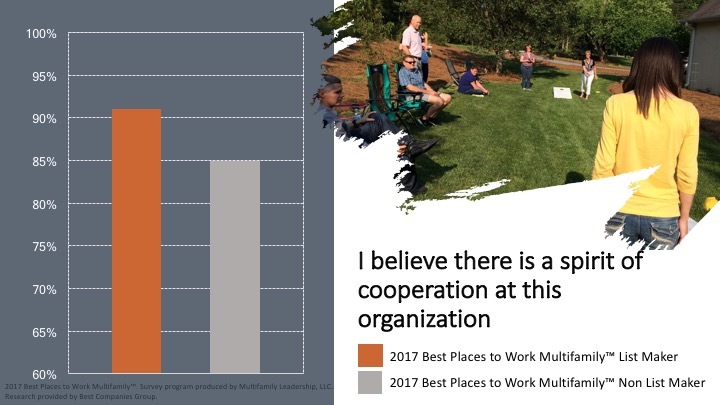 Amongst those that made the list of the Best Places to Work Multifamily™ 91% believe there is a spirit of cooperation at their organization. 85% of employees researched from companies not making the list believe there is a spirit of cooperation at their organization. 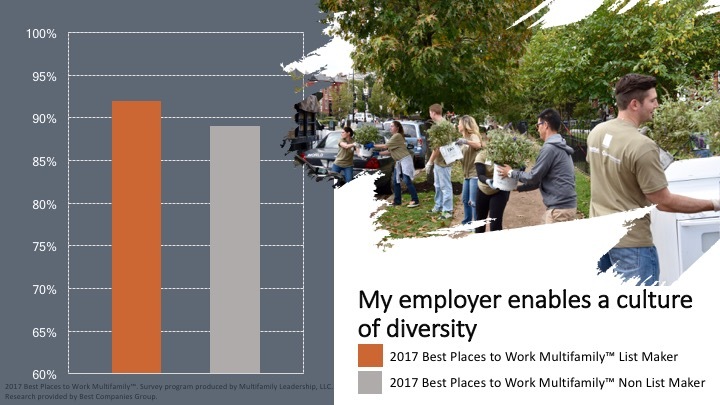 Amongst those that made the list of the Best Places to Work Multifamily™ 92% agree their employer enables a culture of diversity. 89% of employees researched from companies not making the list agree their employer enables a culture of diversity. 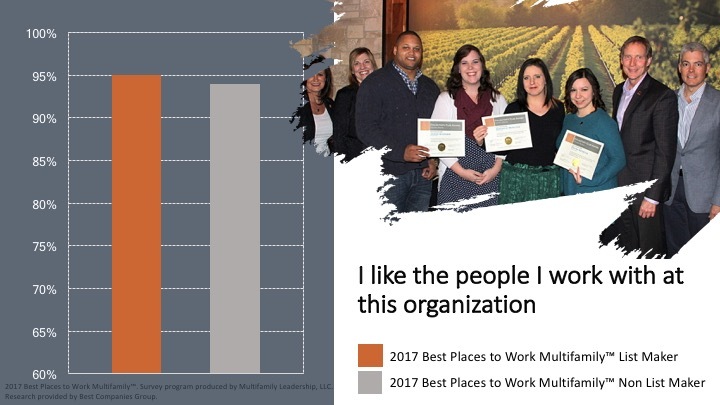 Amongst those that made the list of the Best Places to Work Multifamily™ 95% like the people they work with at their organization. 94% of employees researched from companies not making the list like the people they work with at their organization. 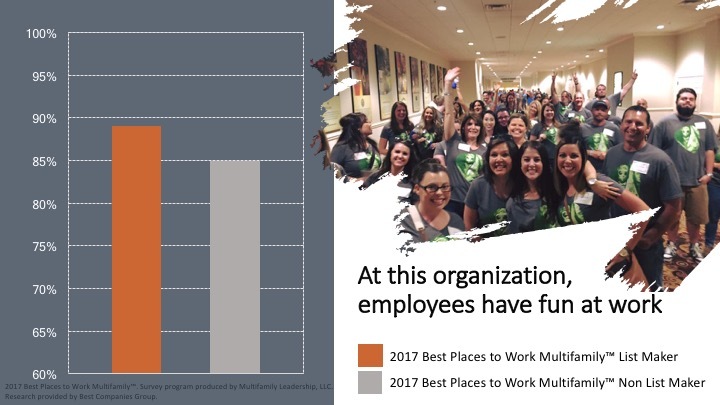 Amongst those that made the list of the Best Places to Work Multifamily™ 89% believe employees have fun at work in their organization. 85% of employees researched from companies not making the list believe employees have fun at work in their organization. 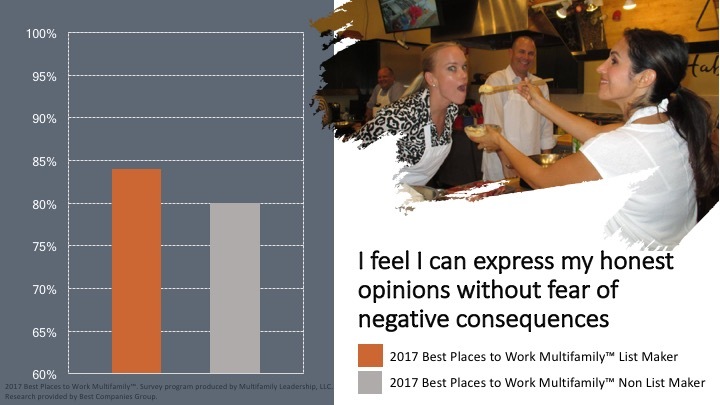 Amongst those that made the list of the Best Places to Work Multifamily™ 84% feel they can express their honest opinions without fear of negative consequences. 80% of employees researched from companies not making the list feel they can express their honest opinions without fear of negative consequences. 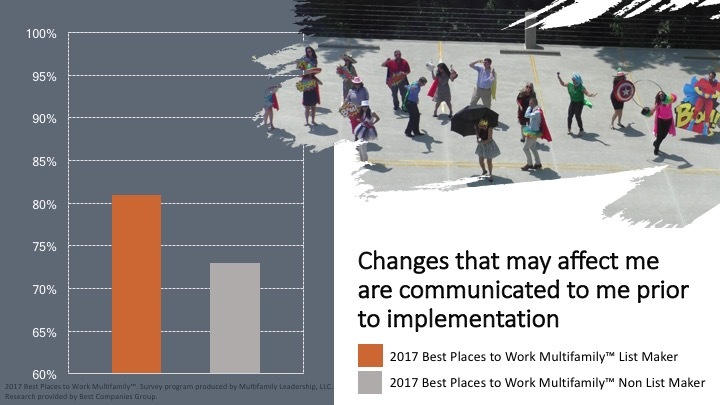 Amongst those that made the list of the Best Places to Work Multifamily™ 81% believe changes that may affect them are communicated to them prior to implementation. 73% of employees researched from companies not making the list believe changes that may affect them are communicated to them prior to implementation. Amongst those that made the list, there is an average of 91% engagement for the aggregate response in the Role Satisfaction section. Amongst those that did not make the list, there is an average of 87% engagement for the aggregate response in the Role Satisfaction section. 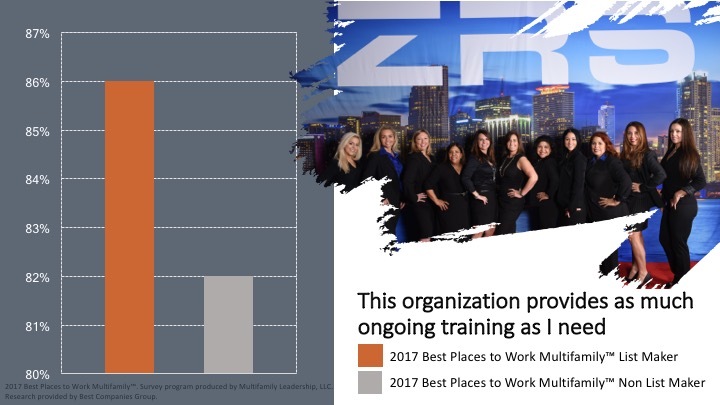 Amongst those that made the list of the Best Places to Work Multifamily™ 97% like the type of work that they do. 95% of employees researched from companies not making the list like the type of work that they do. 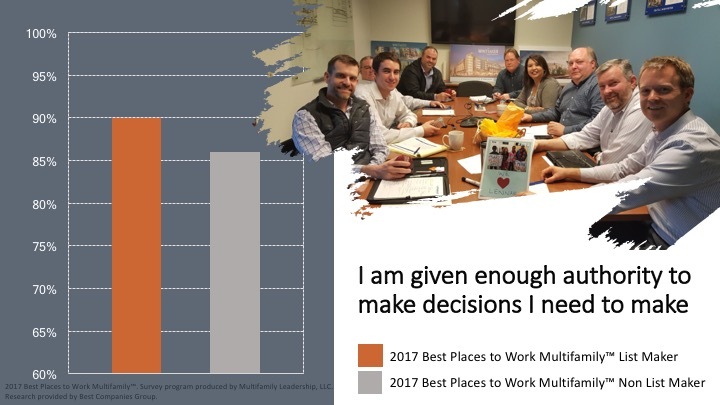 Amongst those that made the list of the Best Places to Work Multifamily™ 90% are given enough authority to make decisions they need to make. 86% of employees researched from companies not making the list are given enough authority to make decisions I need to make. 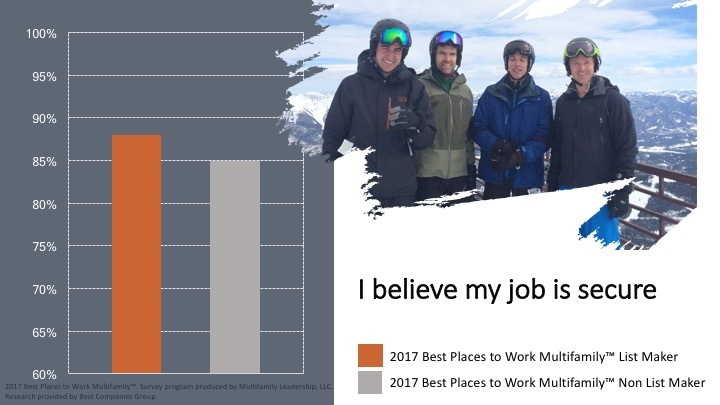 Amongst those that made the list of the Best Places to Work Multifamily™ 88% believe their job is secure. 85% of employees researched from companies not making the list believe their job is secure. 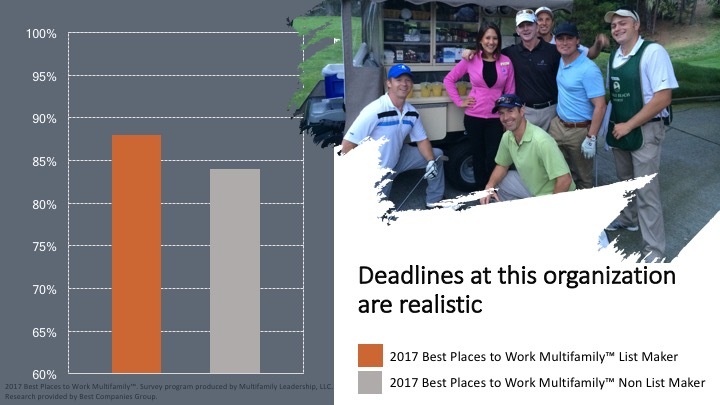 Amongst those that made the list of the Best Places to Work Multifamily™ 89% agree deadlines at their organization are realistic. 84% of employees researched from companies not making the list deadlines at their organization are realistic. 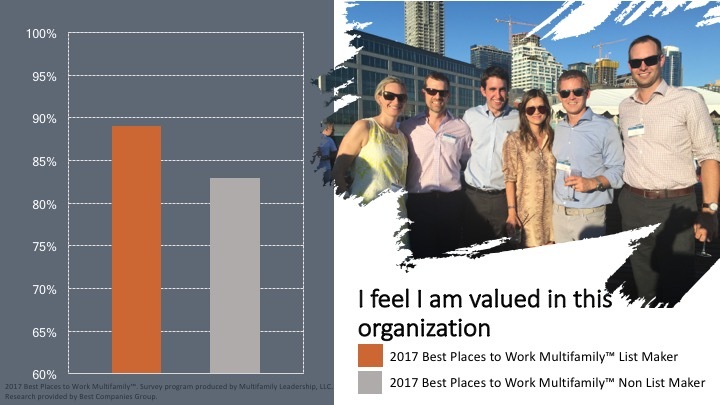 Amongst those that made the list of the Best Places to Work Multifamily™ 89% feel they are valued in their organization. 83% of employees researched from companies not making the list feel they are valued in their organization. 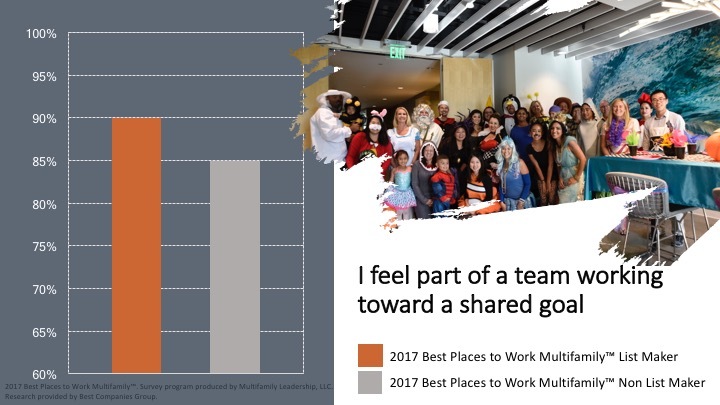 Amongst those that made the list of the Best Places to Work Multifamily™ 90% feel part of a team working toward a shared goal. 85% of employees researched from companies not making the list feel part of a team working toward a shared goal. 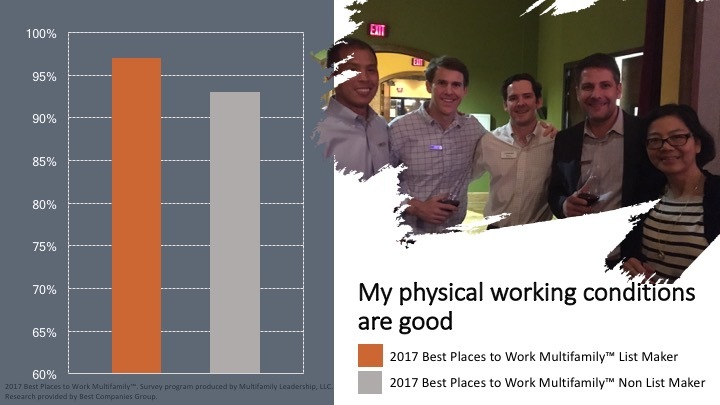 Amongst those that made the list of the Best Places to Work Multifamily™ 86% are able to maintain a reasonable balance between work and my personal life. 77% of employees researched from companies not making the list are able to maintain a reasonable balance between work and my personal life. 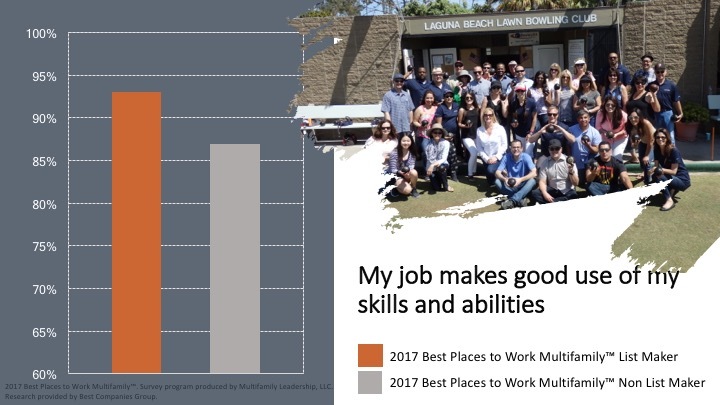 Amongst those that made the list of the Best Places to Work Multifamily™ 93% believe their job makes good use of their skills and abilities. 87% of employees researched from companies not making the list believe their job makes good use of their skills and abilities. 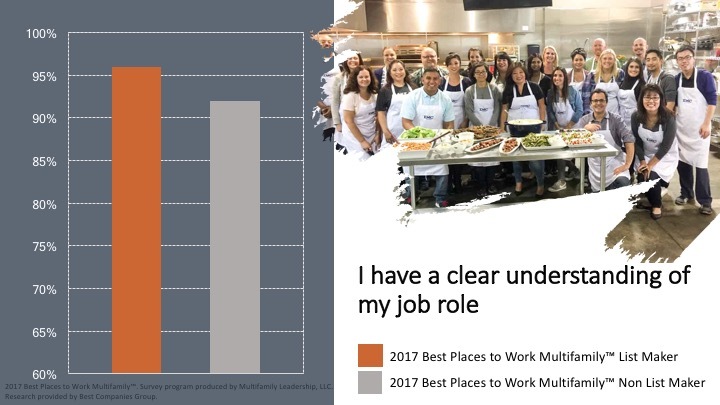 Amongst those that made the list of the Best Places to Work Multifamily™ 96% have a clear understanding of their job role. 92% of employees researched from companies not making the list have a clear understanding of their job role. 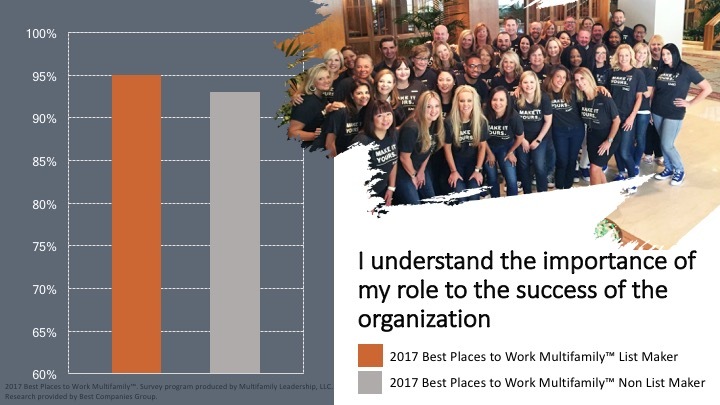 Amongst those that made the list of the Best Places to Work Multifamily™ 95% understand the importance of their role to the success of the organization. 93% of employees researched from companies not making the list understand the importance of their role to the success of the organization. 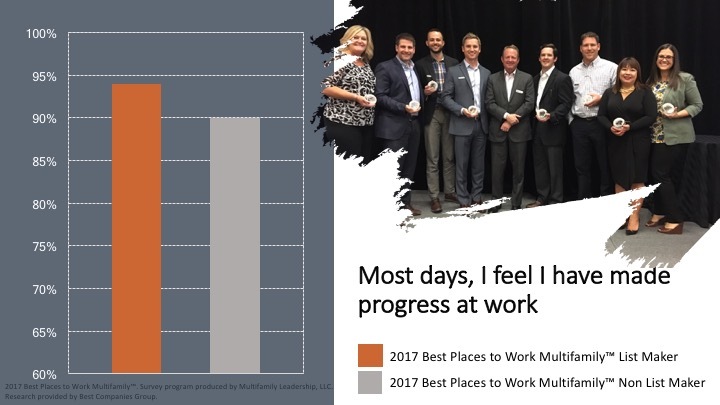 Amongst those that made the list of the Best Places to Work Multifamily™ 94% feel most days, they have made progress at work. 90% of employees researched from companies not making the list feel most days, they have made progress at work. Amongst those that made the list, there is an average of 93% engagement for the aggregate response in the Work Environment section. Amongst those that did not make the list, there is an average of 89% engagement for the aggregate response in the Work Environment section. 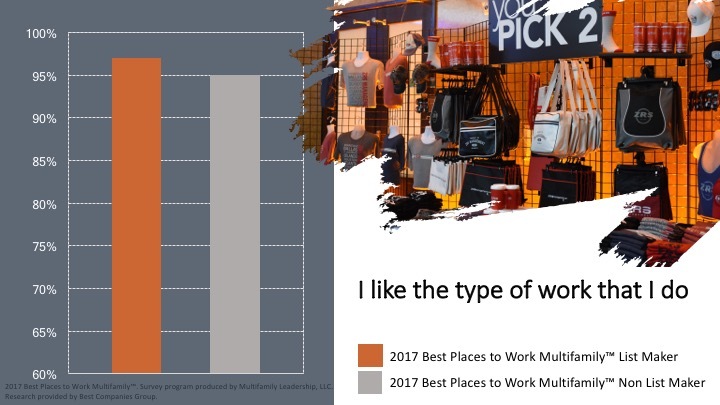 Amongst those that made the list of the Best Places to Work Multifamily™ 97% believe their physical working conditions are good. 93% of employees researched from companies not making the list believe their physical working conditions are good. 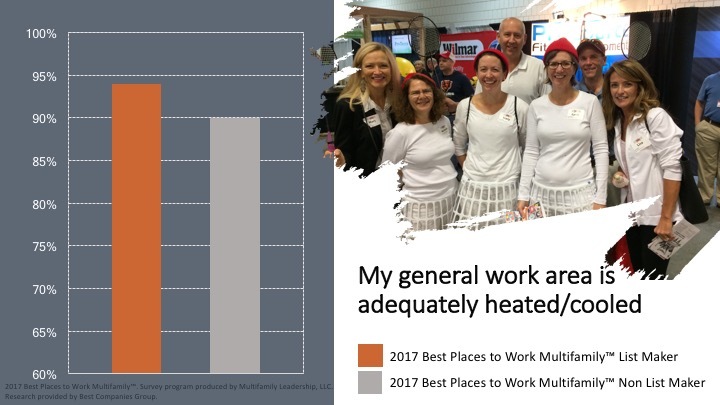 Amongst those that made the list of the Best Places to Work Multifamily™ 94% believe their general work area is adequately heated/cooled. 90% of employees researched from companies not making the list believe their general work area is adequately heated/cooled. 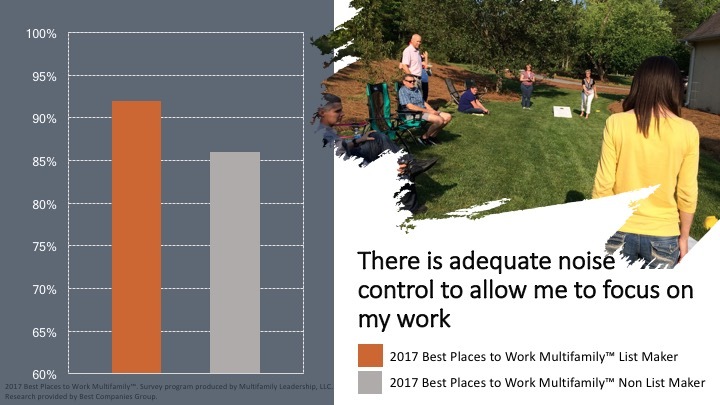 Amongst those that made the list of the Best Places to Work Multifamily™ 92% believe there is adequate noise control to allow them to focus on their work. 86% of employees researched from companies not making the list believe there is adequate noise control to allow them to focus on their work. 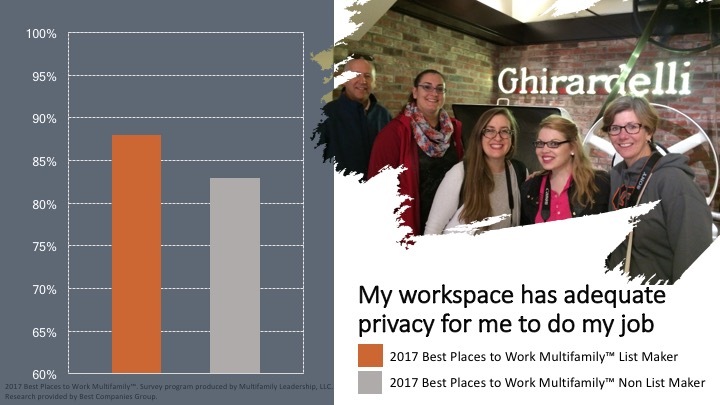 Amongst those that made the list of the Best Places to Work Multifamily™ 88% believe their workspace has adequate privacy for them to do their job. 83% of employees researched from companies not making the list believe their workspace has adequate privacy for them to do their job. 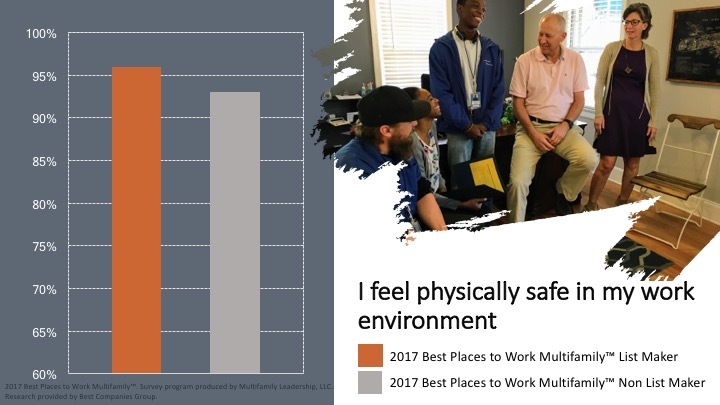 Amongst those that made the list of the Best Places to Work Multifamily™ 96% feel physically safe in their work environment. 93% of employees researched from companies not making the list feel physically safe in their work environment. Amongst those that made the list, there is an average of 91% engagement for the aggregate response in the Relationship with Supervisor section. Amongst those that did not make the list, there is an average of 88% engagement for the aggregate response in the Relationship with Supervisor section. 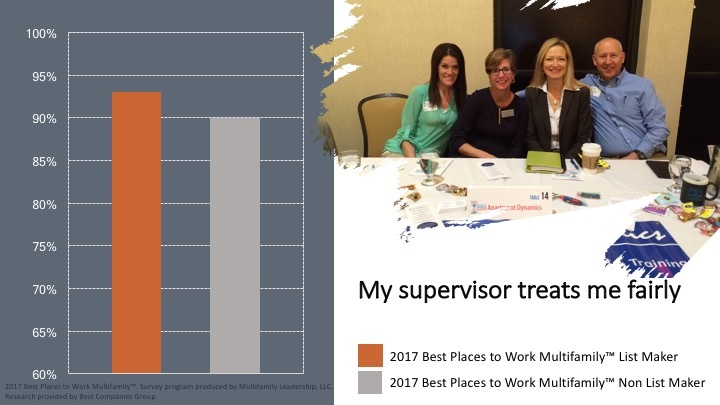 Amongst those that made the list of the Best Places to Work Multifamily™ 93% believe their supervisor treats me fairly. 90% of employees researched from companies not making the list believe their supervisor treats me fairly. 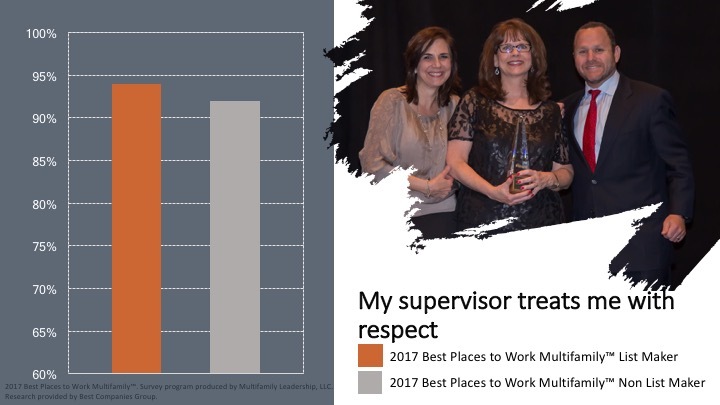 Amongst those that made the list of the Best Places to Work Multifamily™ 94% believe their supervisor treats them with respect. 92% of employees researched from companies not making the list believe their supervisor treats them with respect. 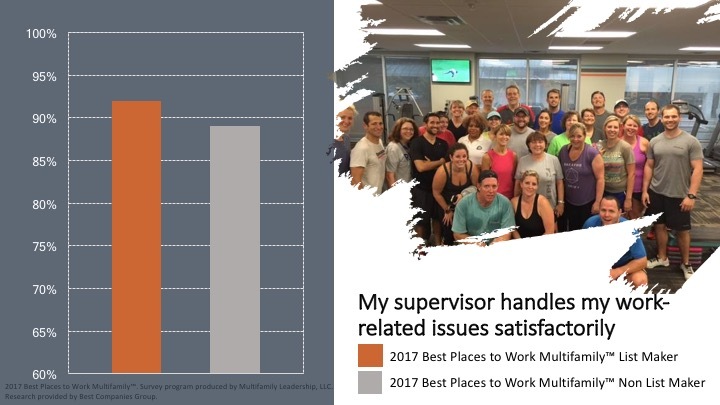 Amongst those that made the list of the Best Places to Work Multifamily™ 92% believe their supervisor handles their work-related issues satisfactorily. 89% of employees researched from companies not making the list believe their supervisor handles their work-related issues satisfactorily. 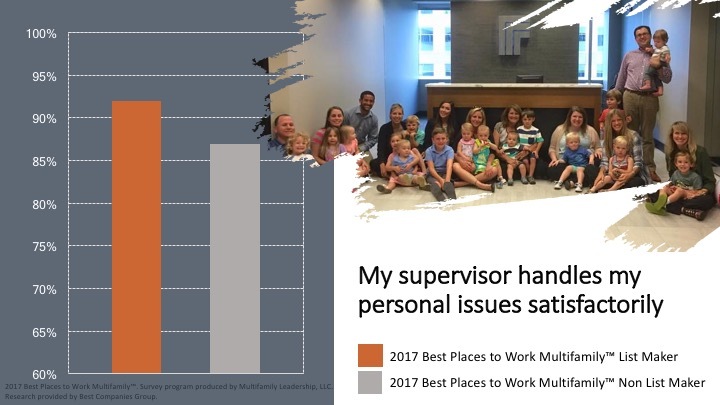 Amongst those that made the list of the Best Places to Work Multifamily™ 92% believes their supervisor handles their personal issues satisfactorily. 87% of employees researched from companies not making the list believes their supervisor handles their personal issues satisfactorily. 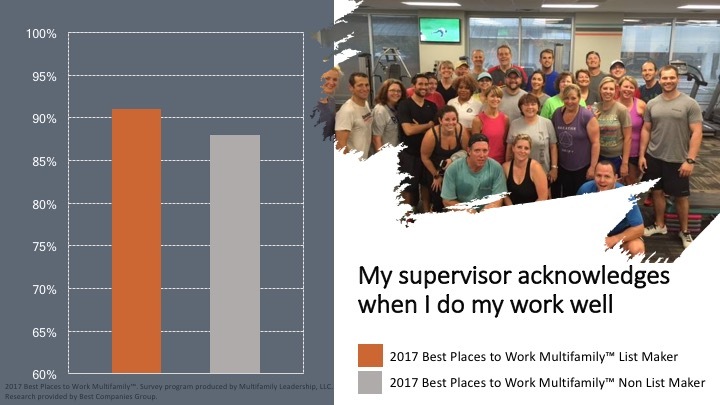 Amongst those that made the list of the Best Places to Work Multifamily™ 91% believe their supervisor acknowledges when they do their work well. 88% of employees researched from companies not making the list believe their supervisor acknowledges when they do their work well. 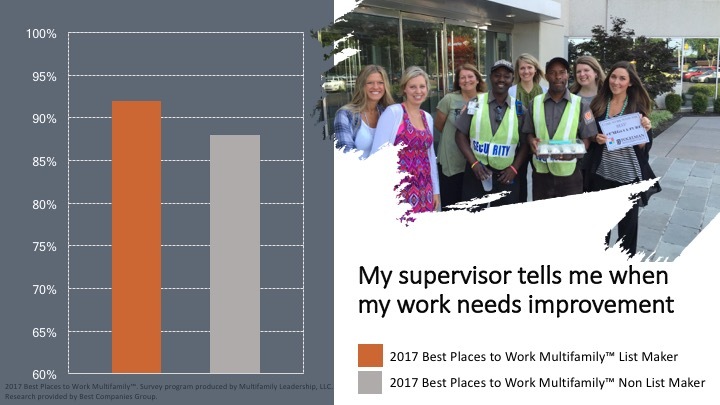 Amongst those that made the list of the Best Places to Work Multifamily™ 92% believe their supervisor tells them when their work needs improvement. 88% of employees researched from companies not making the list believe their supervisor tells them when their work needs improvement. 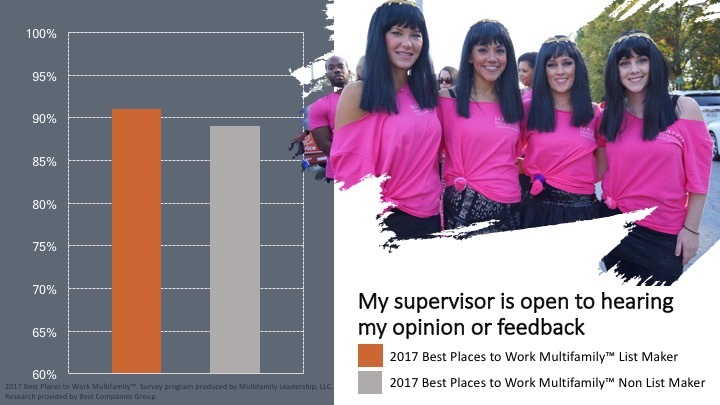 Amongst those that made the list of the Best Places to Work Multifamily™ 91% agree their supervisor is open to hearing their opinion or feedback. 89% of employees researched from companies not making the list agree their supervisor is open to hearing their opinion or feedback. 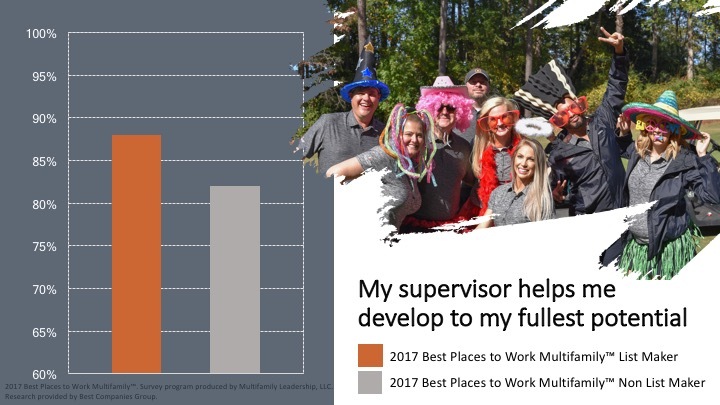 Amongst those that made the list of the Best Places to Work Multifamily™ 88% believe their supervisor helps them develop to their fullest potential. 82% of employees researched from companies not making the list believe their supervisor helps them develop to their fullest potential. 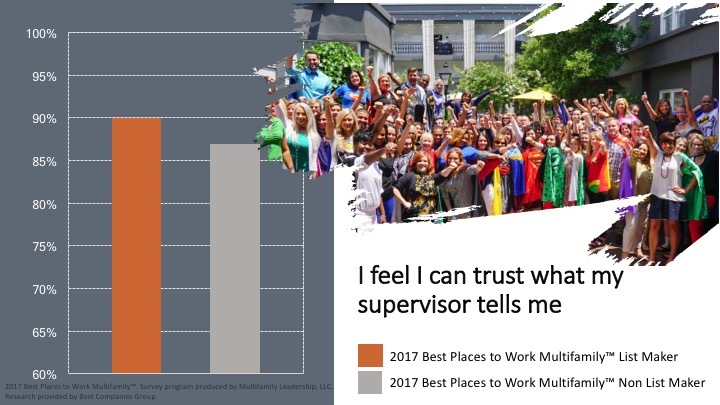 Amongst those that made the list of the Best Places to Work Multifamily™ 90% feel they can trust what their supervisor tells them. 87% of employees researched from companies not making the list feel they can trust what their supervisor tells them. Amongst those that made the list, there is an average of 86% engagement for the aggregate response in the Training, Development and Resources section. Amongst those that did not make the list, there is an average of 80% engagement for the aggregate response in the Training, Development and Resources section. 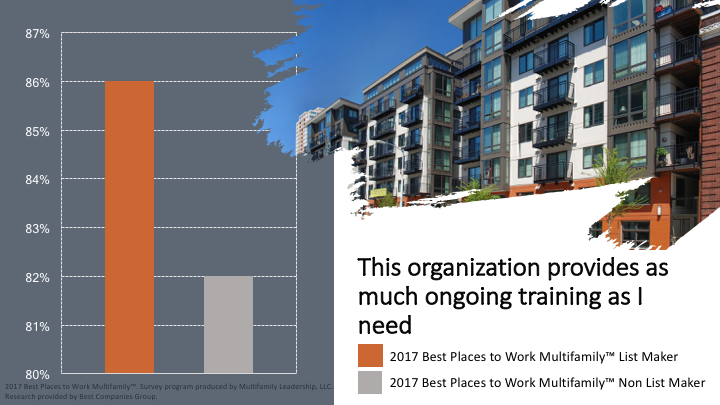 Amongst those that made the list of the Best Places to Work Multifamily™ 83% believe their organization provided as much initial training as they needed. 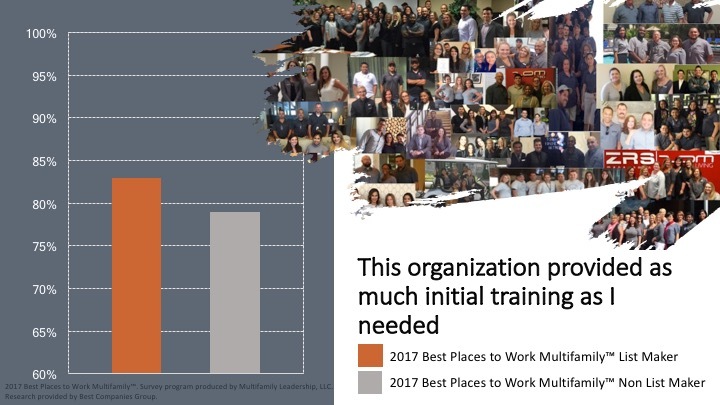 79% of employees researched from companies not making the list believe their organization provided as much initial training as they needed. 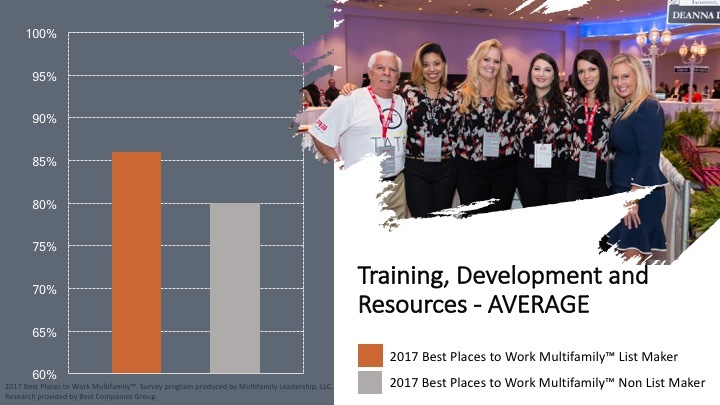 Amongst those that made the list of the Best Places to Work Multifamily™ 86% believe their organization provides as much ongoing training as they need. 82% of employees researched from companies not making the list believe their organization provides as much ongoing training as they need. 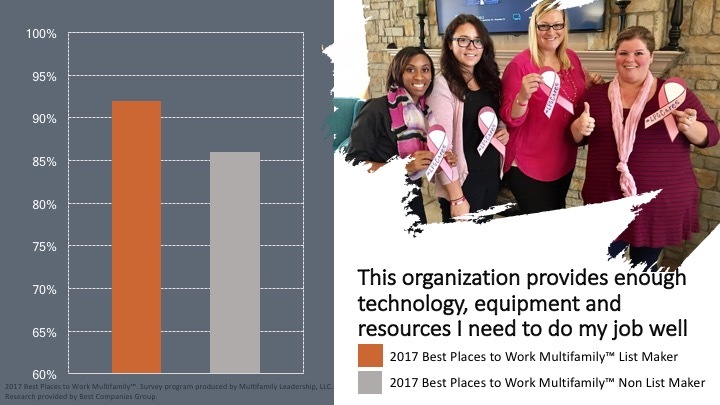 Amongst those that made the list of the Best Places to Work Multifamily™ 92% agree their organization provides enough technology, equipment and resources they need to do their job well. 86% of employees researched from companies not making the list believe their organization provides enough technology, equipment and resources they need to do their job well. 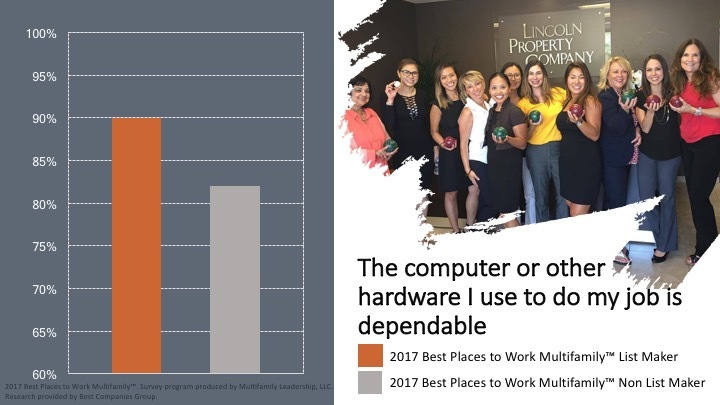 Amongst those that made the list of the Best Places to Work Multifamily™ 90% believe their computer or other hardware they use to do their job is dependable. 82% of employees researched from companies not making the list believe their computer or other hardware they use to do their job is dependable. 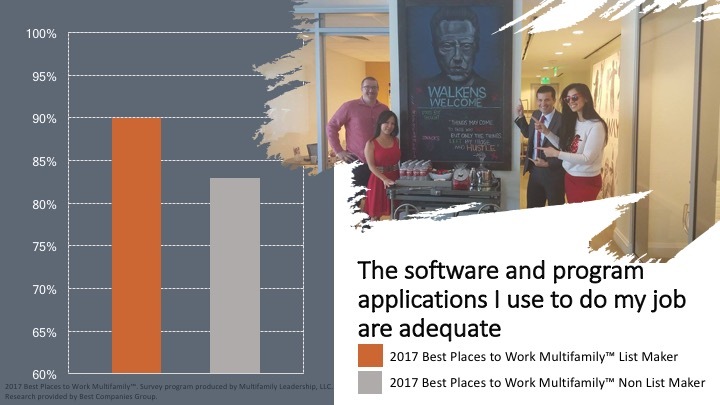 Amongst those that made the list of the Best Places to Work Multifamily™ 90% believe the software and program applications they use to do their job is adequate. 83% of employees researched from companies not making the list believe the software and program applications they use to do their job is adequate. 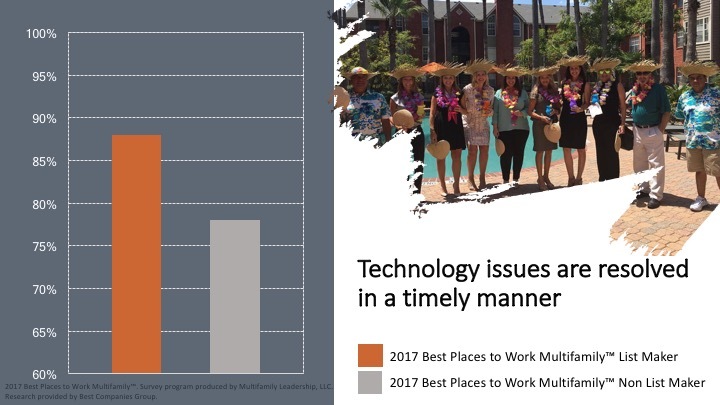 Amongst those that made the list of the Best Places to Work Multifamily™ 88% believe technology issues are resolved in a timely manner. 78% of employees researched from companies not making the list believe technology issues are resolved in a timely manner. 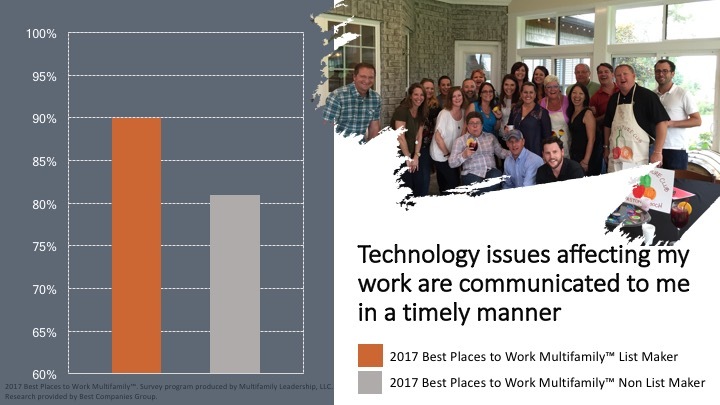 Amongst those that made the list of the Best Places to Work Multifamily™ 90% believe technology issues affecting their work are communicated to them in a timely manner. 81% of employees researched from companies not making the list believe technology issues affecting their work are communicated to them in a timely manner. 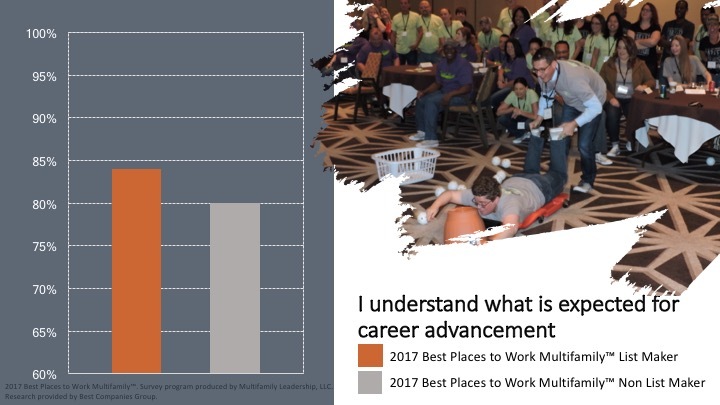 Amongst those that made the list of the Best Places to Work Multifamily™ 84% understand what is expected of them for career advancement. 80% of employees researched from companies not making the list understand what is expected of them for career advancement. 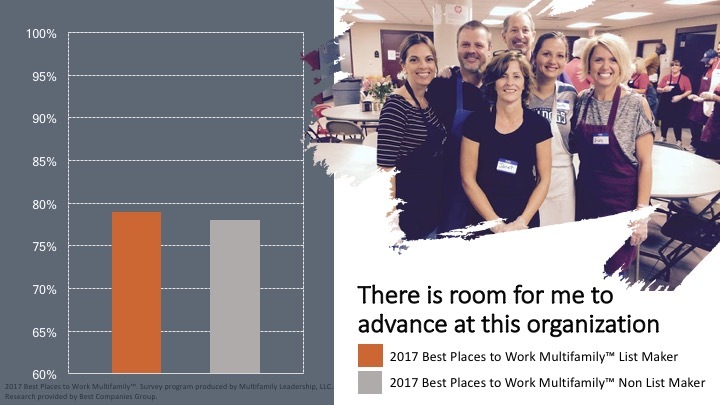 Amongst those that made the list of the Best Places to Work Multifamily™ 81% are encouraged to explore other growth or advancement opportunities within their organization. 78% of employees researched from companies not making the list are encouraged to explore other growth or advancement opportunities within their organization. 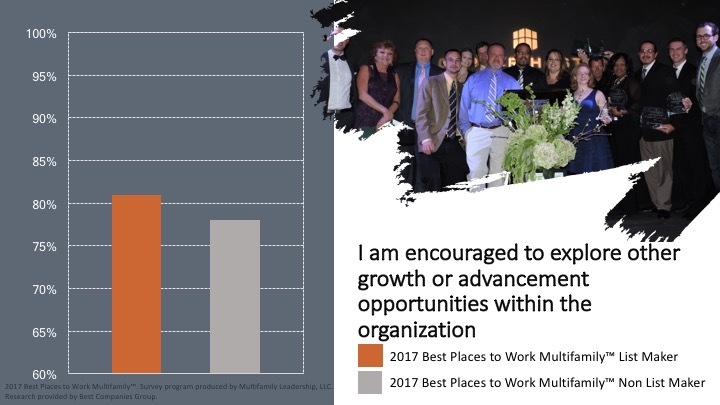 Amongst those that made the list of the Best Places to Work Multifamily™ 79% believe there is room for them to advance in their organization. 78% of employees researched from companies not making the list believe there is room for them to advance in their organization. 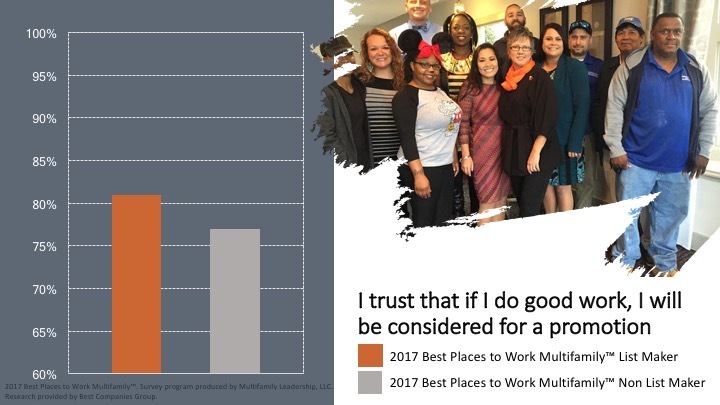 Amongst those that made the list of the Best Places to Work Multifamily™ 81% trust that if they do good work, they will be considered for a promotion. 77% of employees researched from companies not making the list trust that if they do good work, they will be considered for a promotion. Amongst those that made the list, there is an average of 83% engagement for the aggregate response in the Pay & Benefits section. Amongst those that did not make the list, there is an average of 82% engagement for the aggregate response in the Pay & Benefits section. 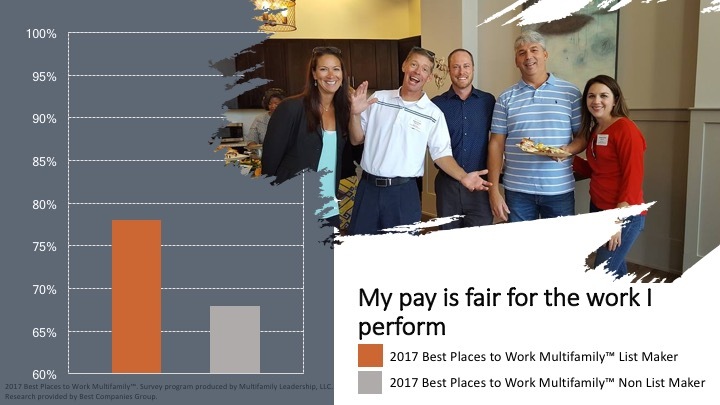 Amongst those that made the list of the Best Places to Work Multifamily™ 78% believe their pay is fair for the work they perform. 68% of employees researched from companies not making the list believe their pay is fair for the work they perform. 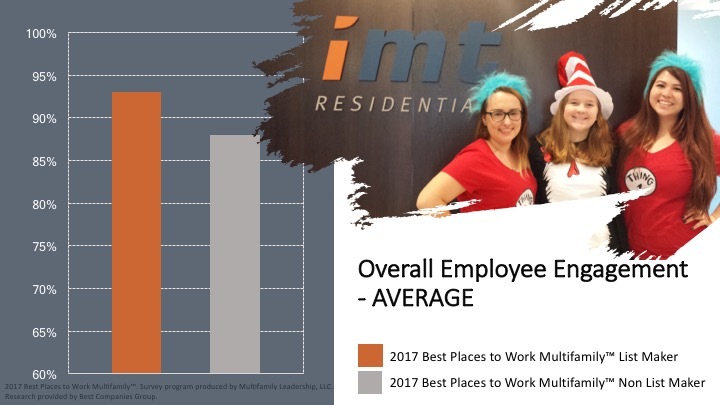 Amongst those that made the list of the Best Places to Work Multifamily™ 85% overall, believe they are satisfied with this organization’s benefits package. 72% of employees researched from companies not making the list overall, believe they are satisfied with this organization’s benefits package. 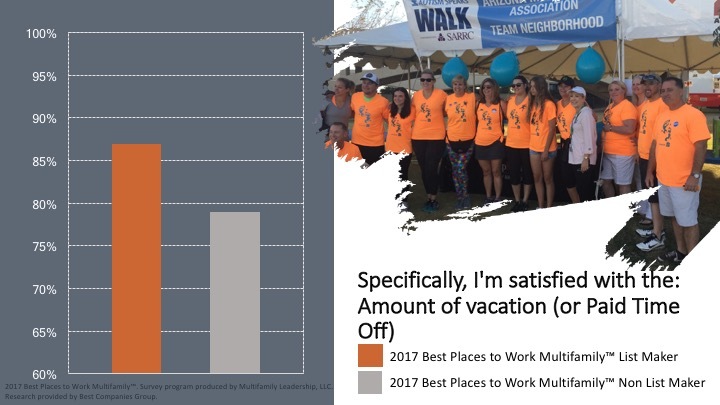 Amongst those that made the list of the Best Places to Work Multifamily™ 87% specifically, believe they are satisfied with the: Amount of vacation (or Paid Time Off). 79% of employees researched from companies not making the list specifically, believe they are satisfied with the: Amount of vacation (or Paid Time Off). 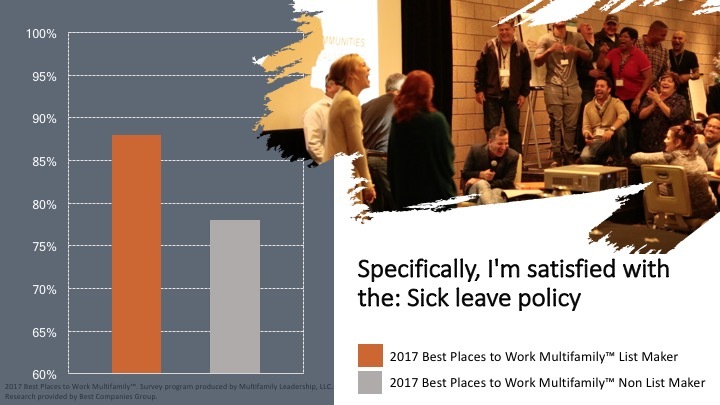 Amongst those that made the list of the Best Places to Work Multifamily™ 88% specifically, believe they are satisfied with the: Sick leave policy. 78% of employees researched from companies not making the list specifically, believe they are satisfied with the: Sick leave policy. 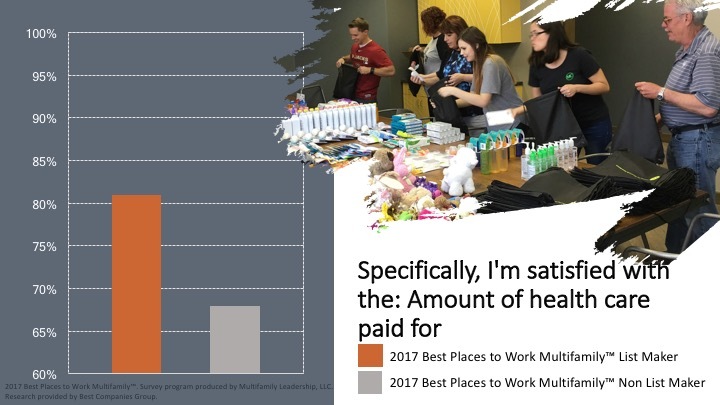 Amongst those that made the list of the Best Places to Work Multifamily™ 81% specifically, believe they are satisfied with the: Amount of health care paid for. 68% of employees researched from companies not making the list specifically, believe they are satisfied with the: Amount of health care paid for. 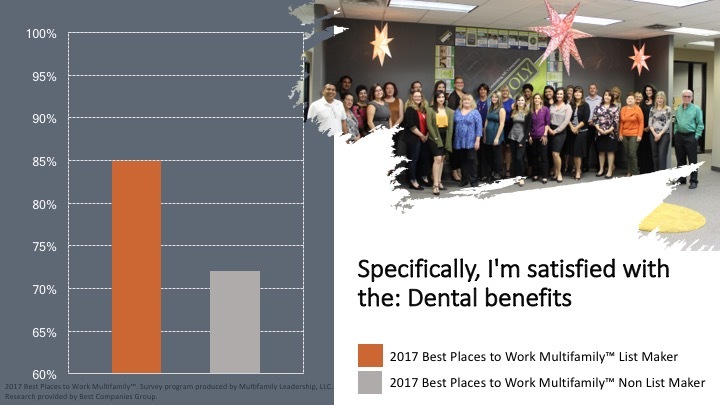 Amongst those that made the list of the Best Places to Work Multifamily™ 85% specifically, believe they are satisfied with the: Dental benefits. 72% of employees researched from companies not making the list specifically, believe they are satisfied with the: Dental benefits. 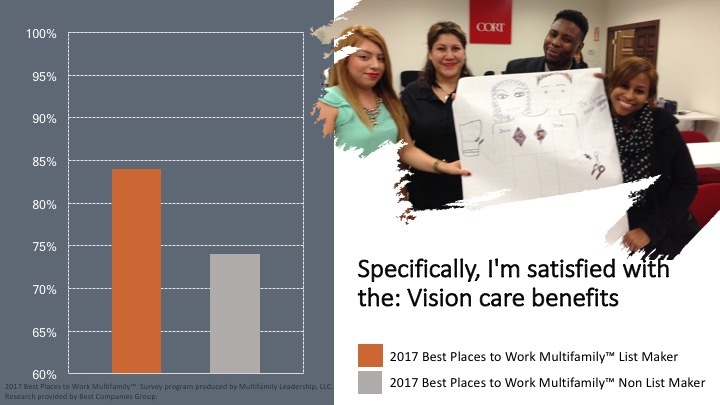 Amongst those that made the list of the Best Places to Work Multifamily™ 84% specifically, believe they are satisfied with the: Vision care benefits. 74% of employees researched from companies not making the list specifically, believe they are satisfied with the: Vision care benefits. 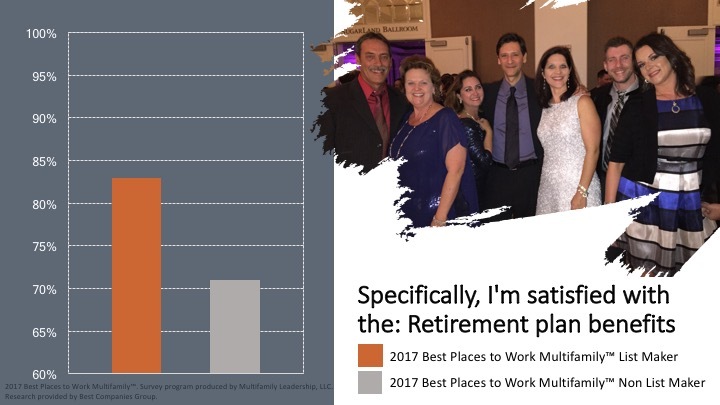 Amongst those that made the list of the Best Places to Work Multifamily™ 83% specifically, believe they are satisfied with the: Retirement plan benefits. 71% of employees researched from companies not making the list specifically, believe they are satisfied with the: Retirement plan benefits. 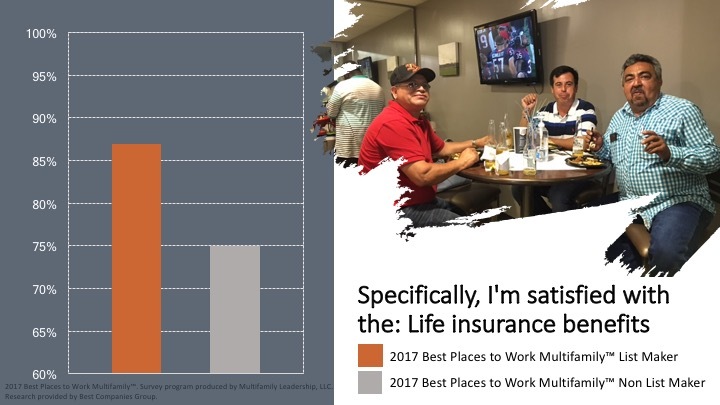 Amongst those that made the list of the Best Places to Work Multifamily™ 87% specifically, believe they are satisfied with the: Life insurance benefits. 75% of employees researched from companies not making the list specifically, believe they are satisfied with the: Life insurance benefits. 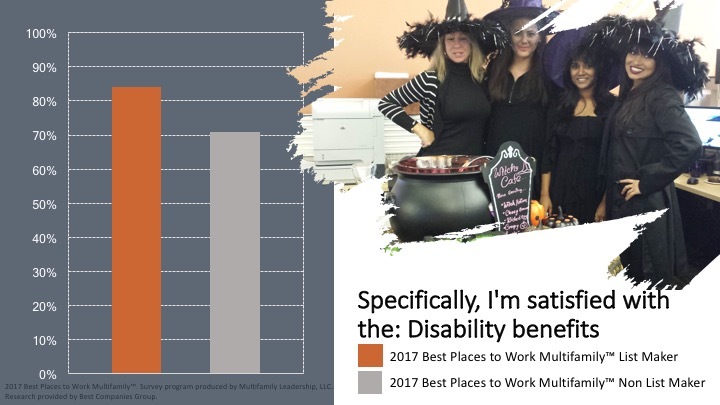 Amongst those that made the list of the Best Places to Work Multifamily™ 84% specifically, believe they are satisfied with the: Disability benefits. 71% of employees researched from companies not making the list specifically, believe they are satisfied with the: Disability benefits. 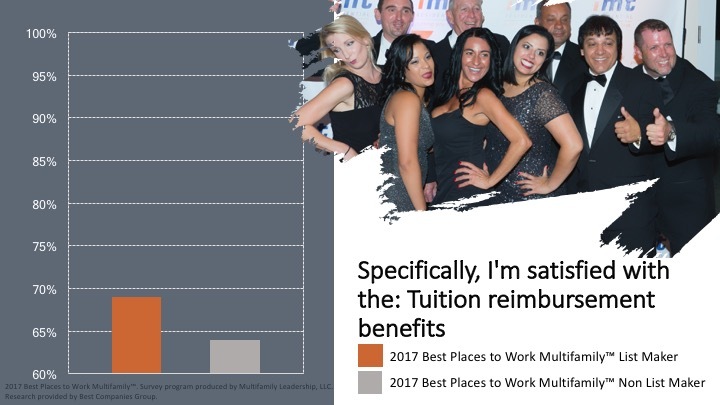 Amongst those that made the list of the Best Places to Work Multifamily™ 69% specifically, believe they are satisfied with the: Tuition reimbursement benefits. 64% of employees researched from companies not making the list specifically, believe they are satisfied with the: Tuition reimbursement benefits. Amongst those that made the list, there is an average of 93% engagement for the aggregate response in the Overall Employee Engagement section. Amongst those that did not make the list, there is an average of 88% engagement for the aggregate response in the Overall Employee Engagement section. 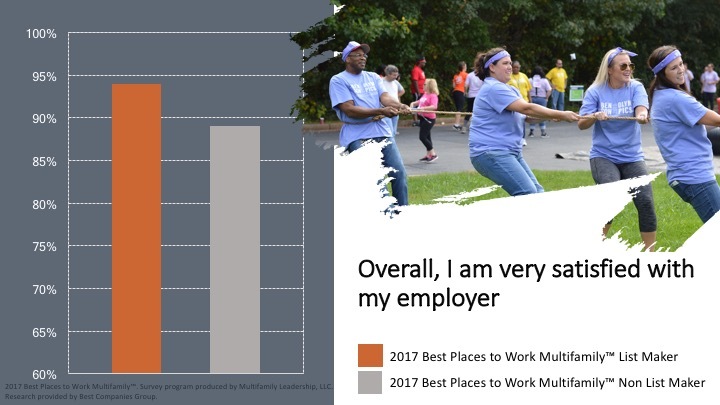 Amongst those that made the list of the Best Places to Work Multifamily™ 94% overall, believe they are very satisfied with their employer. 89% of employees researched from companies not making the list overall, believe they are very satisfied with their employer. 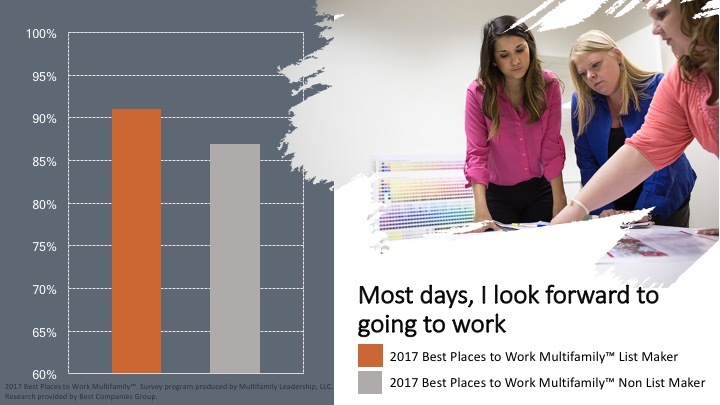 Amongst those that made the list of the Best Places to Work Multifamily™ 91% agree that most days, they look forward to going to work. 87% of employees researched from companies not making the list agree that most days, they look forward to going to work. 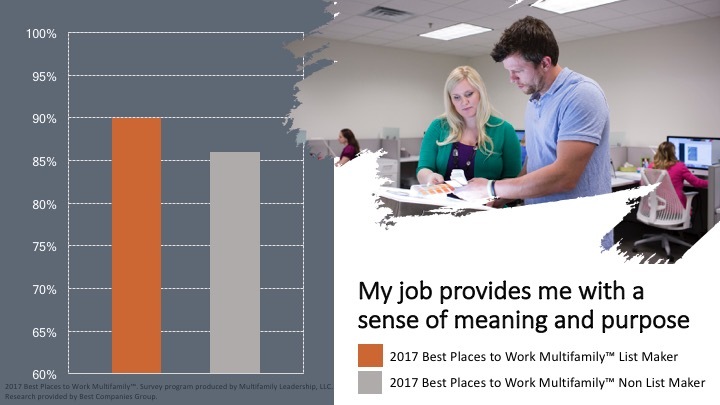 Amongst those that made the list of the Best Places to Work Multifamily™ 90% believe their job provides them with a sense of meaning and purpose. 86% of employees researched from companies not making the list believe their job provides them with a sense of meaning and purpose. 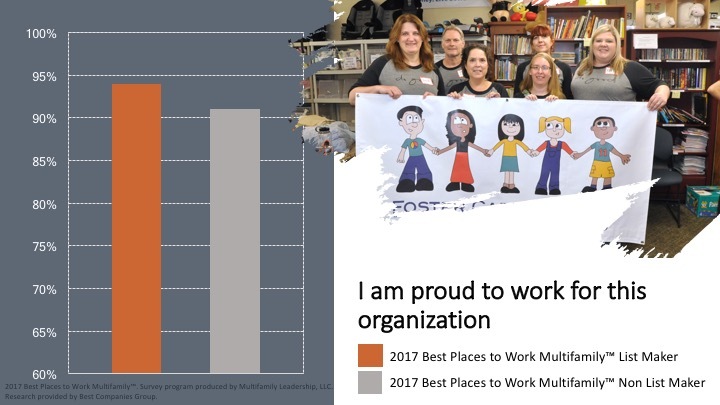 Amongst those that made the list of the Best Places to Work Multifamily™ 94% are proud to work for their organization. 91% of employees researched from companies not making the list are proud to work for their organization. 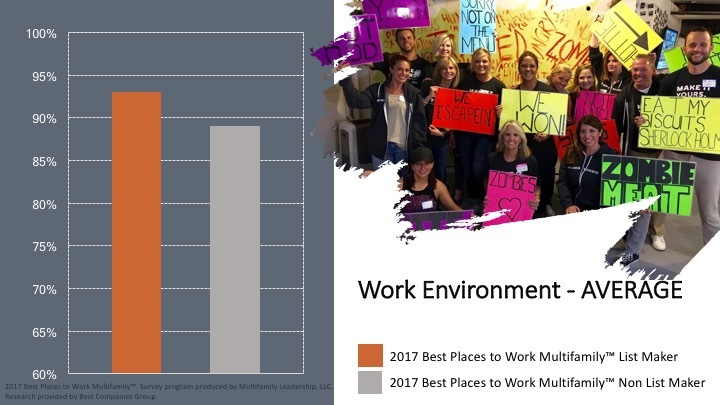 Amongst those that made the list of the Best Places to Work Multifamily™ 91% feel their organization has created an environment where they can do their best work. 84% of employees researched from companies not making the list feel their organization has created an environment where they can do their best work. 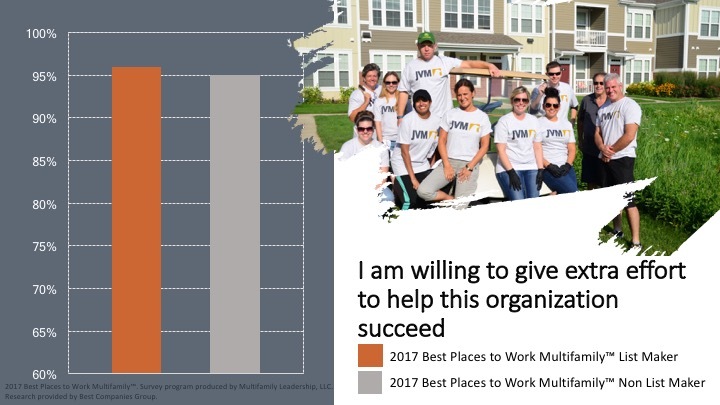 Amongst those that made the list of the Best Places to Work Multifamily™ 96% are willing to give extra effort to help their organization succeed. 95% of employees researched from companies not making the list are willing to give extra effort to help their organization succeed. 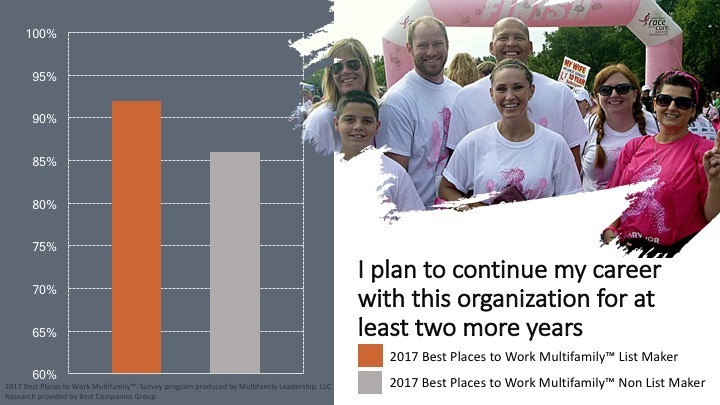 Amongst those that made the list of the Best Places to Work Multifamily™ 92% plan to continue their career with their organization for at least two more years. 86% of employees researched from companies not making the list plan to continue their career with their organization for at least two more years. 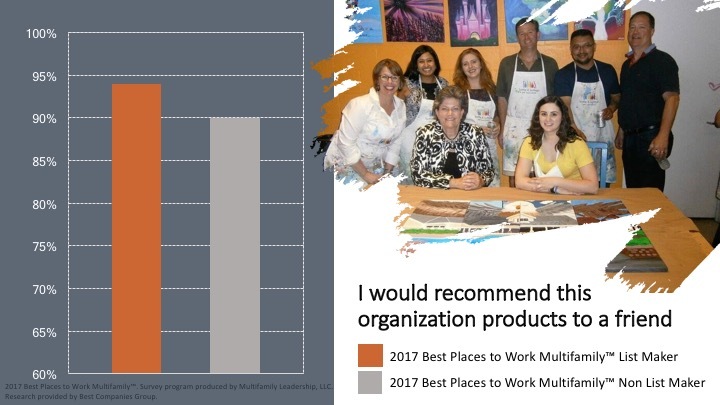 Amongst those that made the list of the Best Places to Work Multifamily™ 94% would recommend their organization’s products / services to a friend. 90% of employees researched from companies not making the list would recommend their organization’s products / services to a friend. 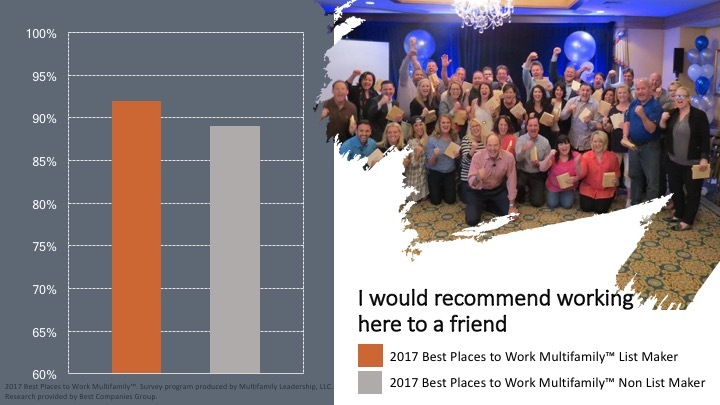 Amongst those that made the list of the Best Places to Work Multifamily™ 92% would recommend working at their company to a friend. 89% of employees researched from companies not making the list would recommend working at their company to a friend.